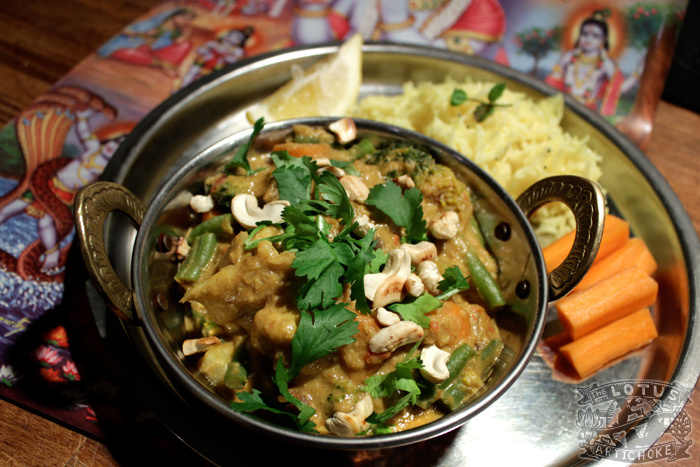 Navratan Vegetable Korma is immensely popular all over the world. It’s another one of those Indian dishes with countless variations and incarnations. Having lots of vegetables, fruits and nuts, and the creamy sauce, however, are standard features. Actually, the name “Navratan” implies (at least) 9 different ingredients. I won’t count yours, if you won’t count mine. It’s no secret that this website and my cookbook feature an abundance of great Indian recipes. Indian food is one of my (many) favorite cuisines! I’ve loved it my whole life, and I’ve been cooking Indian vegetarian food for over 20 years, ever since that first paperback copy of The Higher Taste back in ’91. I also discovered many great recipes during my extended visits to India. It was tricky to decide which recipes to include. One of my youngest brother’s best friends (and a generous supporter on Kickstarter, not to mention all around great guy) made it clear to me how happy he’d be to get a recipe for his favorite Indian dish: Vegetable Korma. It’s a pleasure to share this with you, B! For this recipe, I chose a new route for the smooth, creamy curry. My Paneer Makhani and Dum Aloo recipes involve pureeing ingredients prior to cooking. Here I’ve done things more as I would for a creamy soup: Partly cooked, then pureed, liquid added, and then simmered to a delicious conclusion. It’s also possible to skip the pureeing. You’ll end up with a chunkier korma, which is how some like it anyway. I also purposefully chose soy cream and soy milk for this recipe, though neither are particularly traditional in Indian cooking. Some of these recipes should be faster and simpler, even if they use store-bought, packaged ingredients. My apologies to those of you without easy access to the vegan ingredients us city-folk have. Feel free to experiment, find your own workarounds, or even hit me up for suggestions on other variations and alternate ingredients! Heat 1/4 cup water in pot on low heat. Add chopped cauliflower, beans, potato, carrots. Steam covered until mostly cooked, about 7 min. Turn off heat, keep covered. Heat oil in large pot on medium high heat. Add onion, garlic, ginger. Fry, stirring constantly, 2-3 min. Add cashews, ground cumin, coriander, garam masala, turmeric. Stir. Fry until cashews begin to brown, 2-3 min. Mix in chopped tomato. Cook on medium heat, stirring regularly, 5 min. If you have an immersion blender: Turn off heat, moderately puree tomato, cashew, onions, etc in large pot. If not, simply continue. Add soy cream, sugar, salt, bay leaf, raisins. Stir well. Add in cooked vegetables with remaining water. Stir a few times gently, return to light boil. Add soy milk gradually, stirring. Simmer on low, partially covered, mixing occasionally, 8-10 min. Garnish with coriander leaves and more toasted cashews. Fruit twist: Add 1/2 cup chopped pineapple or mango with raisins toward end of cooking. Vedic (no garlic or onions): Substitute 1/8 tsp asafoetida for garlic and onion. Exotic fruity: Try chopped dates, dried apricots, or figs instead of raisins. No soy: Substitute 1 cup / 240 ml coconut milk for soy cream and 1/4 cup / 60 ml water for soy milk. This entry was posted in Indian, North Indian and tagged Korma, Navatan, north indian, recipe, vegan. Bookmark the permalink. Glad you’re happy! And I can’t wait to hear how it goes. Hey, vegan once a week is a great thing! OMG!! I made this dish yesterday and it’s heavenly delicious!!! What an amazing recipe!! This is definitely a keeper!! Everything tasted great!!! Thanks for sharing!!! Love to hear it, Josee! It’s one of my favorites, too. ;-) Let me know how it goes with other recipes!